Keeping a close eye on your vendors is half of the key to inventory control. You must always be vigilant that the merchandise you are ordering from you vendors is in fact the merchandise you are receiving. And the smart retailer will closely track the profitability of each vendor's merchandise and use this information to exert pressure on vendor's that offer the lowest margins, the longest delivery cycles and the poorest payment terms. To begin, you must keep good records of your vendors. This chapter will cover all of the Vendor related catalogs which will become useful later as you begin to make Purchase Orders and Receipts. Refer to the Catalogs topic for a general explanation of how catalogs work. There are four subforms at the top of the Vendors Catalog: the Vendor Region, the Vendor Type, the Line of Merchandise and the Class of Merchandise. Filling in these subforms is optional and is used mainly as a way to classify and group your vendors: if you want to quickly find all vendors that sell Women's Shoes, for example, or vendors from British Columbia. Most of the fields in the Vendors Catalog are self-explanatory. XpertMart™ will pull information from the Vendors Catalog to fill in Purchase Orders, Receipts and other documents you are likely to send to your vendors, so be sure to enter as much information as you can. You are, of course, free to design the format of these documents and draw only on those fields you deem necessary. The Code is an optional field where you can enter any internal code you might use to classify your vendor. The Account # field is for you to enter the account number assigned to you by the vendor. The Tax ID field is where you can enter the government-issued tax number if required by fiscal authorities in your jurisdiction. If you enter the vendor's email address in the E-mail field you can send emails to contacts directly from the Vendors Catalog by pressing the email button on the toolbar at the top of the catalog. For more information, refer to the Email topic. 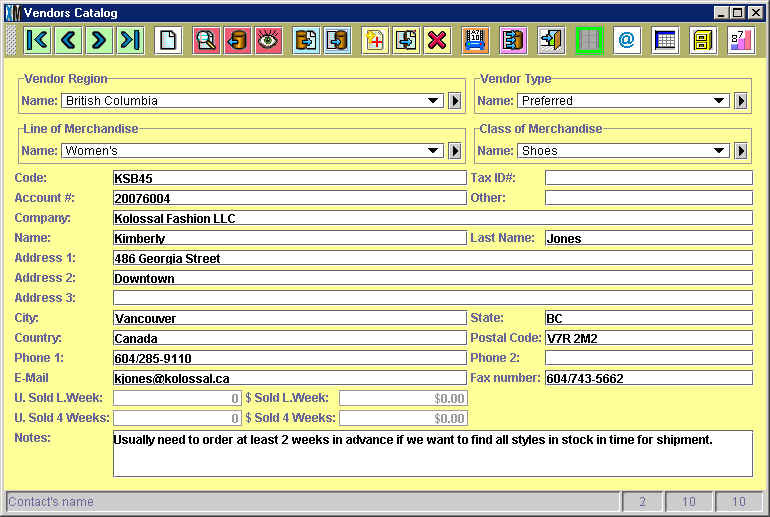 You can press the Kardex or Audit button any time you are browsing through the Vendors Catalog to open up on screen the Receipt Journal for that vendor, as shown below. 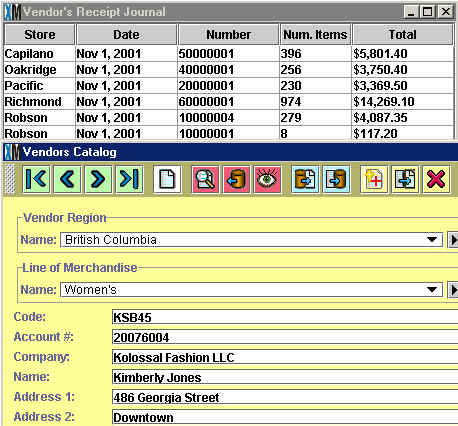 The Receipt Journal lists all transactions that have occured with that vendor in an Audit Table. (To learn more, see the Audit topic). This is a quick way to keep track of activity with a given vendor. If you need more detailed information, you can always click on the reports button on the toolbar for a menu of Vendor Reports. The Vendor Regions Catalog is an optional catalog that you can use to group your vendors by geographic region. The contents of the catalog will appear in the Vendor Regions subform at the top of the Vendors Catalog. Grouping your vendors by region might be useful if you have a lot vendors in your catalog. It will let you quickly filter out vendors so you can analyze only those vendors in a region and compare the margins they offer or delivery times. You can also compare regions to each other. If you discover that merchandise imported from Italy seems to be selling well, you might schedule an extra buying trip to the region. The Vendor Regions Catalog is an optional catalog that you can use to group your vendors by geographic region. The contents of the catalog will appear in the Vendor Regions subform at the top of the Vendors Catalog. Exactly what constitutes a vendor "type" is left entirely up to you. You might want to group vendors according to how easy it is to do business with them, using types such as: Preferred, Second Choice, Competitive Price or Last Resort. This is especially useful if more than one vendor sells the same Style. Alternatively, you can group your vendors by how their relative reliability, employing Gold, Silver and Bronze as your Vendor Types. Another option is to equate the delivery speed with the type, using Overnight, Second Day, One Week and 14 Days. In other words, use the classification system that will be most useful to you. The Vendor Terms catalog must be opened at least once (even if you do not fill it in) before you can make a Purchase Order or Receipt. Use the Vendor Terms Catalog to enter the payment terms that a vendor offers. Usually the vendor terms are: Consignment, Prepaid, Cash on Delivery and Credit.